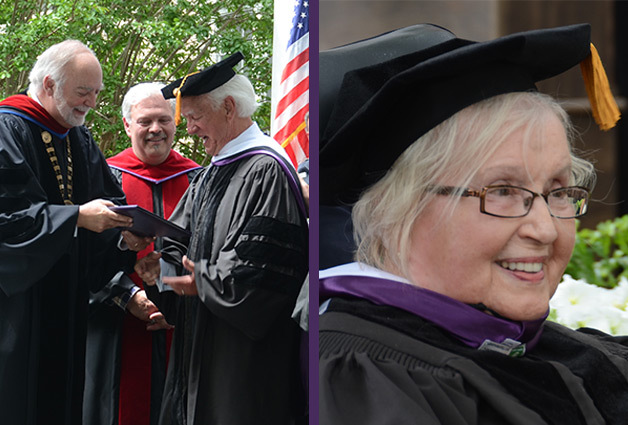 On Saturday, May 9, 2015, Trevecca Nazarene University in Nashville, TN, conferred honorary Doctorate of Letters degrees to Faye and Ben Speer. The degrees were in recognition of their years of Christian service and support of the university. Faye attended Trevecca from 1946 until 1948, when she married Brock. She went back and completed her degree, graduating in 1974. Ben graduated from Trevecca in 1954. Faye and Ben join her husband and his brother, Brock Speer, who was honored with the same degree in 1995. Brock graduated Trevecca in 1950.